NEWS UPDATE: March 26, 2019: Interviews for Interns and Volunteers are being held in State College, PA. Contact the IISOH if you are interested. by supporting one of these campaigns. In this campaign we also seek a benefactor to endow the subject of BOXING which will acquire the ROCKY #3 statue and other material for the Boxing collection. This campaign is designed to immediately raise funds to acquire this famous statue and also to fund IISOH operations for 2-3 years by opening our first office, hire staff, publish more sports posters, conduct more research and publish more on our website. This will fund the IISOH for 2-3 years while we add hundreds of educational pages to our website, collect more books for the library, and open our first office to the public. The IISOH seeks to develop a permanent endowment to support operations. This money is placed into a trust fund and invested - only the interest that is generated is used to support operating expenses such as employee salaries, utilities and daily operations. This long term event seeks widespread public support - ONE MILLION donors - each asked to make a single, once-in-a-lifetime donation of just $25.00 (twenty-five Dollars). To express our gratitude every donor receives a LIFETIME acknowledgement! This solicitation is specifically addressed to the 12.5 million citizens of Pennsylvania, however anyone, anywhere can make a donation. We only actively solicit within the Commonwealth of Pennsylvania at this time. $ 25.00 for a single line tribute on the web page. This ONE TIME donation is for a lifetime legacy on our website. Limited to 160 characters including spaces. $ 250.00 for a single line tribute PLUS a linked web page with a biography and selection of photos. The donor may write the text (subject to editing and approval) and supply up to 20 photos. $500.00 for a single line tribute plus a linked page (as in #2) PLUS an engraved patio brick paver (12 x 12 inches) placed in a walkway on the IISOH campus. $1,000.00 includes #1, 2 and 3 above PLUS an engraved bronze plaque mounted on a TRIBUTE wall inside the Library or the Museum when it is constructed. 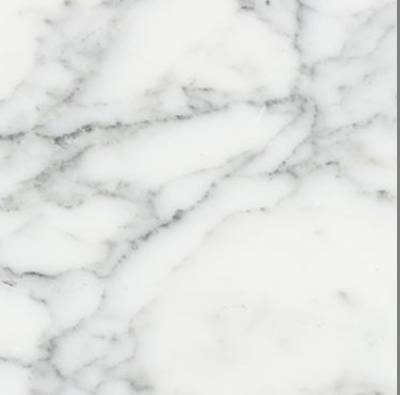 Custom Plan ($2,500.00 or more...to 30 Million Dollars) funds a tribute in many different varieties such as statuary, marble or bronze monuments, named rooms in the buildings or even naming an entire building for $30 million. For example a statue with landscaping can be dedicated "in honor of" or "in memory of" someone special. These donations create permanent legacies in the ACKNOWLEDGEMENT section of the IISOH website and will also be displayed inside the buildings when the Library & Museum is constructed. They serve as permanent, lifelong TRIBUTES to family or friends, colleagues or special event such as a birthday, graduation, marriage, childbirth, etc. This ongoing project has no time limitations. The funds that are generated are distributed among the various IISOH endowments where needed. $25.00 for a single line HONORARIUM (160 character limit). $250.00 for a single line HONORARIUM PLUS an engraved brick paver (12 x 12 inches) to be placed in a WALK OF CHAMPIONS that would lead to the statue. The IISOH would like to raise one million Dollars to design a "WALK OF CHAMPIONS" and acquire a unique bronze statue to honor the Philadelphia Eagles. The statue has already been determined. 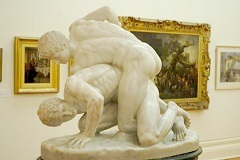 This is a Museum project to install art on the planned IISOH sport campus. It is considered as an "outdoor Museum room." The statue will be mounted on a pedestal and surrounded by landscaping and benches. Plaques or other displays will highlight the story behind the team and its success. Other football teams and as well as other sports can request a similar project, such a the Pittsburgh Steelers or Philadelphia Phillies baseball team. Any sport, any team from any state or country can sponsor a similar TRIBUTE statue as an outdoor, Museum "room" with a one million Dollar endowment. The IISOH solicits donations of BOOKS, POSTERS, MEMORABILIA - from a single book to an entire library, all sports subjects. Books, printed matter, magazines, journals, periodicals are desirable in all languages to develop a multi-lingual collection. ALL support is gratefully appreciated, from $5.00 donations to mega-millions, and there are many naming opportunities available. All donations over $25.00 receive lifetime recognition in various forms including the permanent website ACKNOWLEDGEMENT page, engraved bricks, pavers and plaques, bronze signs mounted on walls or obelisks and other forms authorized by the Board of Directors. Recognition for the higher levels of support include naming opportunities for rooms, galleries, even entire wings of buildings and, of course, naming rights for the LIBRARY, the MUSEUM, the DANCE THEATER, the IISOH RESTAURANT, the replica of the ANCIENT STADIUM OF OLYMPIA and the various sports buildings (including a planned Natatorium). There are a limited number of permanent naming opportunities for the buildings and sports facilities, for example the LIBRARY is a single opportunity, the Museum is a single opportunity. There are almost unlimited naming opportunities for rooms in the buildings. There are no limits for subject endowments such as FOOTBALL, BASEBALL, BASKETBALL, WRESTLING, SPORTS MEDICINE, FENCING, and hundreds of other subjects. 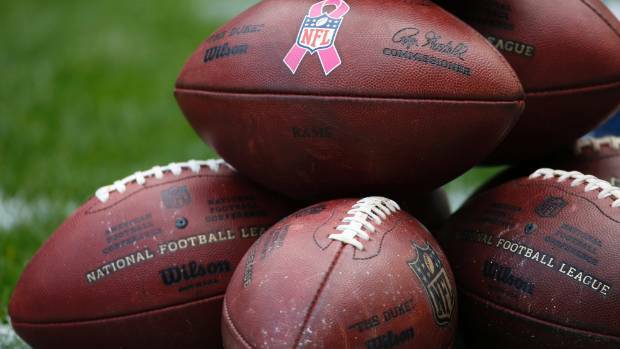 In other words there can be three FOOTBALL endowments, each specifically designed by the donor, such as a focus on one team, a region or a type of sport such as College Football Endowment or Philadelphia Eagles endowment. This program ACTIVELY solicits DONATIONS or ADVERTISING from businesses in Pennsylvania, but any business in the world may contact the IISOH to participate. The goal is to obtain at least a $25.00 "once-in-a-lifetime" donation from each and every business in Pennsylvania. There are almost one million businesses in the Commonwealth of Pennsylvania and these donations would fund the Operating Endowment. Any business (as well as any individual) that donates $25.00 is given a LIFETIME acknowledgement both on our website and inside our Museum when it is built. There are two possible "upgrades," costing $250.00 each. The first "upgrade" is a donation of $250.00 in return for a lifetime acknowledgement that includes TWO parts; an acknowledgement on the website PLUS a link to a single, static web page, hosted by the IISOH. You can design the web page or we can design it for free. We ACKNOWLEDGE your larger donation forever with the basic information of the business, such as name, address, date of creation, etc. As an ACKNOWLEDGEMENT this page cannot have any products or services included - it is a "thank you" page, but it is forever! The IRS rules strictly prohibit anything else such as products or services offered. This would be a tax deductible donation. The second "upgrade" is an advertisement for $250.00 that is a three (3) year agreement. This is a true advertisement linking the lifetime acknowledgement on the IISOH website to the company's website. Our advertising program is for three years - a long and inexpensive ad for any business to promote their goods and services. Only $250.00! With an advertisement the IRS allows us to support you with endorsement, which we CANNOT do for a tax-deductible donation (IRS rules). This linked page can be to your own website or we can design a page for you if you are not on the web yet. We are seeking widespread public support! We are very grateful for your financial support just once in your lifetime. We will never come back to you and ask you to donate again, and again, and again. We do hope that you will follow the IISOH over the years as we grow and develop. We do ask that you invite your friends to support us as well. Share the news about our project with everyone you know. Do you prefer to send a check? The IISOH is a Pennsylvania non-profit corporation - donations are tax deductible. Welcome to our simplified html website. is designed to be much more elaborate and beautiful, with advanced coding. Information on this site will eventually be migrated to the new site as it becomes available. This site is ideal for older browsers and was originally hosted at harveyabramsbooks.com as a public service. Those pages were relocated here as of April 13, 2017. Many updates are taking place during 2019, especially the NOC Directory. We will also be establishing a European office in Vienna, Austria in 2019. Latest updates 23:54 (Eastern Daylight Savings time), March 26, 2019. The images on this page show the range of our Sport in Art collections that are planned - from ancient Greek statuary to modern statuary. 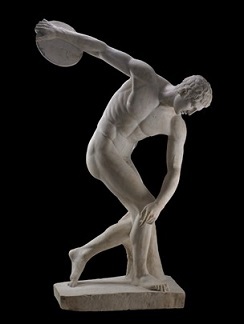 We have arranged for a copy of the ancient Discus Thrower (British Museum) to be made for our collections. 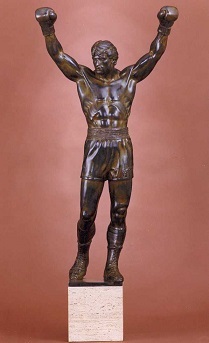 We have first rights to acquire the modern statue of ROCKY #3.